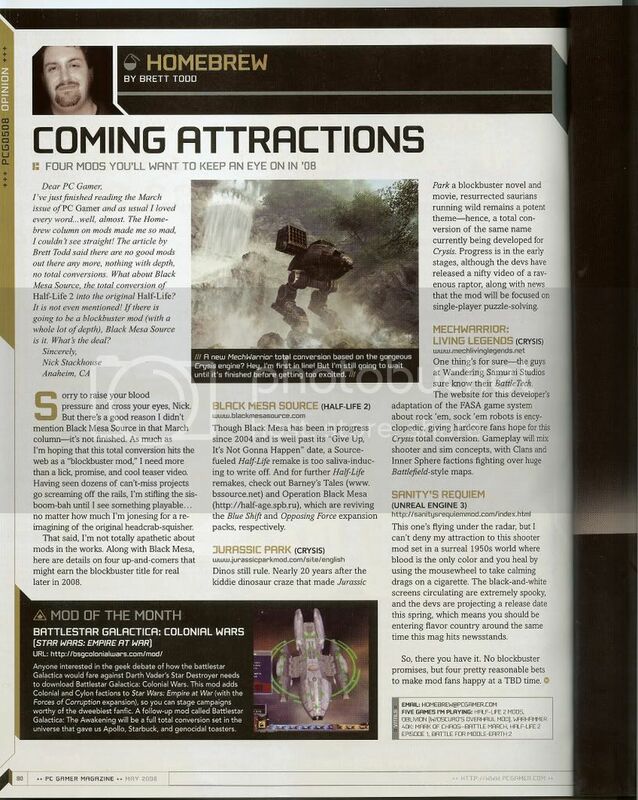 Well as the title says BSG Colonial Wars was in the May USA Edition of Pc Gamer, titled Mod of the Month, it appears that we have been recognised as a good mod , below are some images for you to view from the magazine one of the main page and then zoomed up onto our part, i have to say i big thankyou to PC Gamer itself for recognising this mod, but mostly to Major a Payne without him this mod wouldn't be where it is, he outstanding skill in both modelling and coding has led us to this mod, with my combined assitance with web hosting and running and releasing the mod i have to say on my part most credit for this mod should be given to Major a Payne. I am proud that this mod is one of two mods from the Empire at War Community which has been in this magazine and in my year and a half in modding in this community i have seen many great mods and i hope they will sometime get their fare share of public publicity. Thanks is given to everyone who has helped the mod in its production. I hope that everyone feels like i do because i was shocked when i was told by one of our american fans and thanks is also givento swgbex for also notifying me and for scanning the magazine article for us, Thanks. Congratulations to Battlestar Galactica Colonial Wars may Battlestar Galactica The Awakening be as succesful as its brother mod. Still, there are more stuff, like how many bones are needed, what are the bone names? How do the weights need doing and also this is way to high poly! Funny you ask, you didnt give me a very good idea of what needed doing for the animations, i really need to be told alot more detail, i mean is this even your model???? i ope to be there next time. sry i didn't make it.